TAG TEAM Marketing 2019 Convention Announced In Los Angeles! 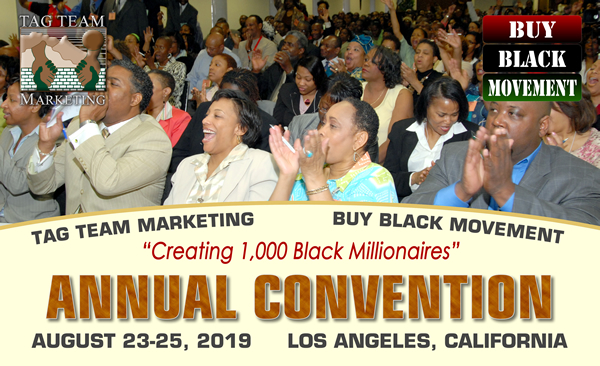 TAG TEAM Marketing just announced that the 2019 TAG TEAM Marketing / Buy Black Movement Convention will be held in Los Angeles, California! This is exciting news for members all over world who will be attending this epic event. The theme of the convention is "Creating 1,000 Black Millionaires". At the 3-day event, attendees will learn exactly how to accomplish that task, by working together as a team. Attendees will receive detailed training that will transform their lives and earning potential. This event will mark a whole new beginning for TAG TEAM Marketing's Buy Black Movement program. Incredible announcements and new releases will be made at the convention that will explode the success of the movement.